Doing presentations is an important aspect of my job, and I have to say, I really enjoy it. I am always looking at ways to improve myself and am ready many documents and books on the subjet. 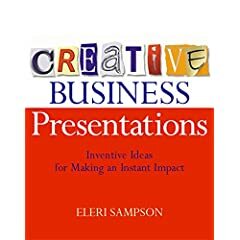 “Creative Business Presentations” by Eleri Sampson was a great read with many interesting ideas and insights. While reading the Presentation Zen Blog there was a reference to the Creative Business Presentation book. After reading it through, I really like the step-by-step approach of this, with many ideas and comments that are worth putting in practice. I’ve started the search for a new mobile email device / solution. Here are my thoughts and final decision of why I chose the solution I selected. And as this blog entry is written during the research and selection process, I don’t know yet what the final result / solution is. A review of Alan Cooper’s book with the subtitle: “Why high-tech products drive us crazy and how to restore the sanity”. Looking at why technological devices (and more specifically the software related to them) drives end-users nuts, makes them feel like idiots and do not consider interaction design or a clear representation of the target user during their development. During a discussion with a friend, I recommend he reads The Invisible Computer (perhaps the subject of another blog entry)… in exchange, he told me that I should read “The inmates are running the asylum” without providing me any form of additional information. The title sounded very intriguing and the content was worth reading through.